As a kid, I loved Quaker packets of instant oatmeal for breakfast. This Field Berry Oatmeal is the latest of my favorite packet flavors to be converted into a Trim Healthy Mama compatible recipe (see the end of this post for a list of them all! ); it’s full of healthy carbs and boasts a good bit of lean protein for sustainability. You’re not going to feel hungry too soon after enjoying this E for breakfast! We’ve been picking wild black raspberries in abundance for the last few weeks, so they were my first choice to use in this recipe, but you could use any berry. I think blueberries would be especially amazing since heating them up enhances their sweetness! 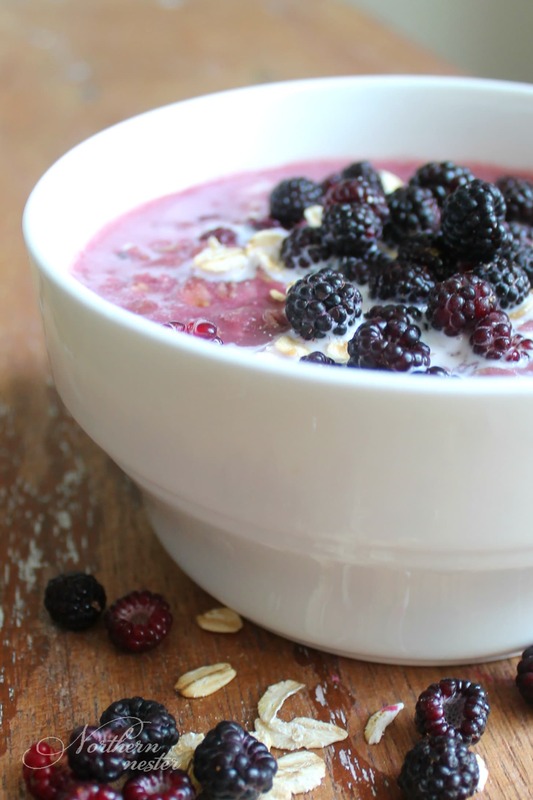 You don’t need any special ingredients to make this frugal bowl of Field Berry Oatmeal. I’ve listed a tablespoon of collagen for extra protein, but you can leave it out and stir in some 0% fat Greek yogurt or low-fat cottage cheese instead, if you prefer. If you leave off the tablespoon of half & half (only 1.5 grams of fat, so it easily fits within the guidelines for an E meal), and use gluten-free oats, this breakfast is also gluten-free and dairy-free! A high-protein, low-fat, Trim Healthy Mama-friendly alternative to instant packets of Field Berry Oatmeal! It's like having dessert for breakfast. A THM E.
Put all ingredients except half & half and garnishing berries in a saucepan. Bring to a boil over medium heat, stirring often. Boil for 3 minutes. Remove from heat, cover, and let stand for 2 minutes. Pour into a bowl. Pour half & half and fresh berries on top. Enjoy immediately. You can use any plan-approved sweetener in this recipe to taste. Fresh or frozen berries may be used in any amount since this is an E breakfast. *Collagen is optional, but gives this breakfast a great boost of protein. You may wish to add 0% fat Greek yogurt or low fat cottage cheese instead. Love oatmeal as much as I do? Here are some of my other favorite E breakfasts to try!